Staying active and doing daily tasks as you get older can be a challenge. You may find that neither your body nor your mind works as well or quickly as it once did. Regardless if you suffer from a debilitating medical condition or you have arthritis that impairs your ability to function with ease, there is help. The Disabled World states 6.1 million people rely on canes, crutches, and walkers annually. The good news is you can choose from a variety of these transportation devices and which can lessen your burden and enhance your mobility in the process. Knowing basic information about your options is the key to making the best choice and having a higher quality of life. One of the biggest challenges you may face is going where you need to without the assistance of others. Of course, being independent is sure to be high on your list of priorities as you get older. The last thing you will want is having to rely on friends and family to always be there to help you get through the day. Taking a brief amount of time out of your day and visiting Quingo USA can allow you to see a variety of motorized scooters. This device is compact and easy to navigate regardless where you’re headed. 1. Improved lifestyle – Do you love to go grocery shopping, but getting around the store is a problem? 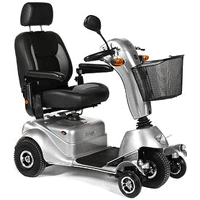 If so, relying on a scooter of this type can have you moving along the aisles with ease. 2. Comfortability – The last thing you want is to be stuck in a device that isn’t comfortable when you’re trying to get help moving. This item can be custom made to assist you in moving with ease and aid you in remaining healthy in the process. 3. Affordable – Most elderly people are on a strict budget and are looking for an affordable option. Choosing a scooter can help you remain mobile and may be covered by your health insurance in some cases. One of the more basic ways to provide you with stability as you get older is a walking cane. These are inexpensive and easy to use to assist you in remaining mobile over time. Walking canes provide lots of support for your body and can be the ideal way to assist you staying active over the years. This item can additionally help reduce the stress on your knees, and is beneficial to any person that is getting older. Additionally, using a walking cane in the right capacity may even be helpful in strengthening your upper body. Not being able to maintain your balance and walk with ease isn’t uncommon among seniors. One way to allow you to do so is by purchasing a walker to assist you with walking. There are a variety of walkers on the market today, and it’s essential to consider your basic needs. For instance, if you’ve suffered a stroke and have partial paralysis, you may benefit the most from a hemi walker. These are designed to help individuals that don’t have full control of the entire body and can be extremely helpful in allowing you to be mobile. Getting older doesn’t mean you have to stop living or enjoying life. You simply need to find the right mode of transportation to allow you to keep your body moving and make the most out of every day. Taking time to find the device that suits your needs and enables you to do the things necessary daily is entirely possible! This is a blog post by Nancy Evans. How to Tell Whether You Have Allergies or a Cold?